I am here to tell you, however, that it is so. Not Moon Base 7’s famous grilled cheese sandwiches, but the fact that I have become such a world-weary traveler that I can sit in an extremely desirable Mediterranean destination, compare it to another, and find it wanting. This opinion, I hasten to add, is not Malta’s fault. Malta is, in fact, a perfectly adequate island, in possession—I am certain—of many fine qualities. Those qualities, however, remain eclipsed by factors that, not long ago, would have been incidental, but which now loom large enough to derail an entire holiday. The first, and most pervasive of these, is the hotel. A decent sized room, sometimes large enough for a table and chairs. A balcony, or outdoor seating area. A café/restaurant/lounge area where you can sit with a drink and relax with a book. Maid service that has your room cleaned by, say, 2 PM. A view of something, anything. Our hotel in Malta had none of these. 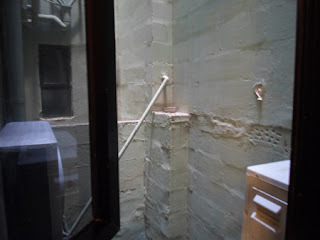 The room was tiny, with an archer’s slit of a window that looked out onto a brick wall. The bathroom was so small that, after you showered, you had to dry off in the bedroom. And there was no place in the hotel to sit an relax, which was a shame because the maids didn’t clean the room until 5PM, which made it less like a hotel and more like a B&B, where you were expected to get up and leave and not return until the end of the day. This wouldn’t have been so bad had it not been for the second factor: The Area. 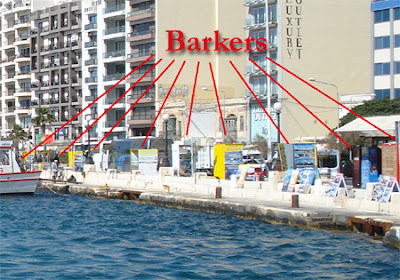 The other side of the road—once you found a crossing—hugged the waterfront and might have been idyllic had it not been for the barkers. Every ten feet you encountered someone touting bus tours or boat excursions, making what should have been a nice stroll into something reminiscent of a county fair midway. "Step right up! Buy a trip for the little lady! C'mon now, best deal in town!" Even this might have been manageable had it not been for a third factor: we were both sick. I felt bad on the flight, and worse when we arrived. Then my wife got a cold. And being forced out of our room and not allowed back in until 5PM and having not much to do except wander around and pose as bait for barkers did not make for pleasant days. 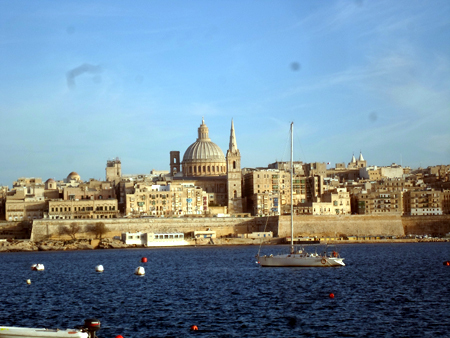 Valletta, just across the bay from us. We went twice. It is a 2018 European City of Culture. It was marvelous; you must visit! Midway through the holiday, I began to suspect that triskaideka-trickery was at work, and as soon I go home I checked my holiday spreadsheet (you knew I had one, didn’t you?) and found, to no surprise, that our Malta trip was our thirteenth excursion to the Continent. I am not superstitious (much) but, I can’t deny the evidence, or the outcome. Aww, I know the feeling of not enjoying a holiday (Tunisia, step forward, full of tacky tourist stuff and people who pester you non stop). Tbh it's quite hit and miss in lots of European places - they pack the herds in and wangle as much money as they can from them. Book something else asap so you've got something to look forward to! Is now a bad time to mention that I'm currently in Australia visiting my friends? Australia? Must be nice. Are you coming back? I wish I didn't have to! Back next Tues. I've put in an order for the weather to be at least 10°C when I get back, so I can start running and cycling again. It's in the low 20s here now, but it was high 30s last week. Been to the beach, went stand up paddle boarding today. I could definitely live here! Oh that's a shame. You obviously didn't spend a lot of time on Trip Advisor before you went though? I went to Malta in my 20s in the middle of the summer and at that time at least, it was THE hottest place I'd ever been to. No, didn't look at Trip Advisor, we just booked a package through BA and went. I think it would have been an okay holiday if the weather had been better and we hadn't both been sick. Enjoyed reading your (mis)adventure. First World problems, I recognize. I've lived in 6 or so Third World Countries, and not all of it was an adventure, but now my man and I feel we've been there and done that, and yes, we now want all the joys of nice hotel rooms and creature comforts. Hope you are now well and try out Europe for a 14 trip. My profile doesn't link to my site -- don't know why. For what it's worth, it's lifeintheexpatlane dot com where I write about my own (mis)adventures living abroad. Yes, Trip Number 14 sounds less ominous than Trip Number 13. I'm already looking forward to it. I had a look at your website. Turns out, I've been there before. You are quite the adventurer. I don't call myself the Accidental Expat for nothing--I never intended to move to the UK and now that I have I don't intend to go anywhere else. (And, as noted above, I like my creature comforts.) But you certainly get around! My hat is off to you.